Amid the charges of “erasing history” that have been levelled against those wishing to remove controversial statues—of John A. Macdonald and Edward Cornwallis in Canada, and Robert E. Lee and other Confederate leaders in the US—it is worth considering the role that such monuments have in the first place. In short, monuments are a part of history, and we should study them accordingly; but they do a very poor job of recording history. Let’s start by considering one of the most important monuments to the ancient Athenians: a sculptural group of the so-called tyrannicides. 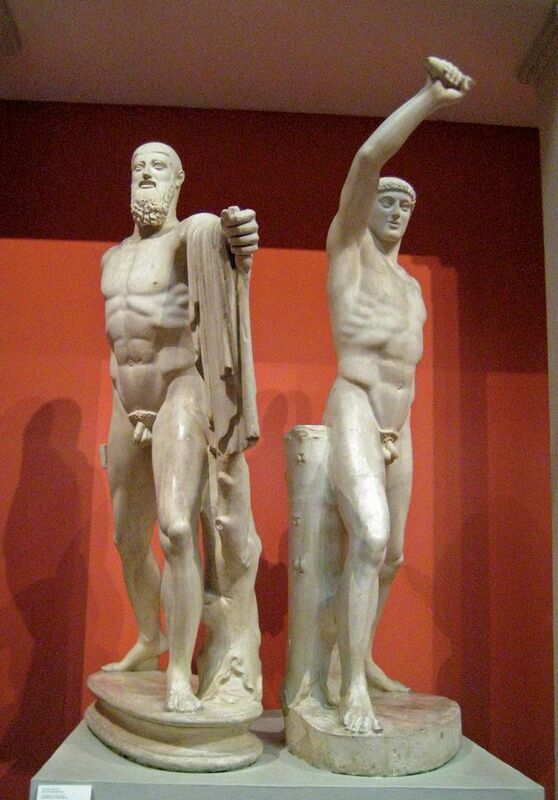 Consisting of two figures representing Harmodius and Aristogeiton, who were said to have slain the last of the tyrants of Athens and paved the way for democracy, the statues stood in the centre of Athens as a symbol of liberty. Poignantly, they were taken to Persia after Xerxes—whom the Athenians saw as the ultimate tyrant—sacked and burned Athens in 480BC. After the Athenians helped to drive Xerxes from Greece, they celebrated their liberation by commissioning a new tyrannicide group. This second sculpture inspired many imitations, one of which can now be seen in Naples. Even the original was returned to Athens a century-and-a-half later, after Alexander the Great conquered the Persian Empire. He, or one of his successors, sent back the plundered statues as a powerful symbol of liberty’s triumph over despotism. Yet, their symbolic importance aside, the sculptures’ role in preserving history is rather problematic. Thucydides, writing at the end of the fifth century BC, said that the Athenians got the tyrannicides all wrong. Instead of nobly sacrificing themselves, Harmodius and Aristogeiton committed murder as part of a lovers’ quarrel, and only managed to kill Hipparchus, the tyrant’s brother. The actual tyrant, Hippias, held on to power for several more years and ruled much more harshly after his brother’s death. And for Alexander to bequeath the monument to Athens as a symbol of liberty is problematic, to say the least. Although he was a king ruling largely through military might, Alexander wanted to be seen as a champion of Greek freedom, and the tyrannicides suited his propaganda purposes. His plan worked all too well. Today, the Greeks claim Alexander as one of their national symbols. But the former Yugoslav republic of Macedonia also claims to be Alexander’s homeland and has erected a statue of him in the centre of its capital, Skopje—much to the chagrin of many modern-day Greeks. No, statues and monuments do not preserve history, and removing, renaming or otherwise modifying them can represent a fruitful, if fraught, engagement with history. At their best, museums, rather than monuments, provide the physical and conceptual space for teaching about history. The monument-museum dichotomy is well encapsulated by two US institutions. The National World War II Memorial in Washington, DC, rightly prioritises the commemoration of those Americans who fought in the war. This is not a space, nor perhaps should it be, to delve more deeply into the difficult questions concerning the war and its context. Instead, the National World War II Museum in New Orleans has displays on those Americans who fought and died, but also raises challenging issues such as the stereotyping of Japan and the internment of Japanese-Americans. The memorial in Washington is a part of history in that it conveys a certain American attitude towards, and interpretation of, the war and its meaning. The museum in New Orleans helps to preserve history and teach it to future generations. Let’s not confuse the two. And let’s not forget that monuments tell us much more about those who set them up than those they represent. If figures like Macdonald and Cornwallis, both of whom had troubling legacies with respect to their treatment of indigenous peoples, no longer represent the ideals we as a society want to convey and encourage, it makes perfect sense for their images to be reviewed and even removed. In any case, “history” is in no danger of being erased.